Strengthens teeth. 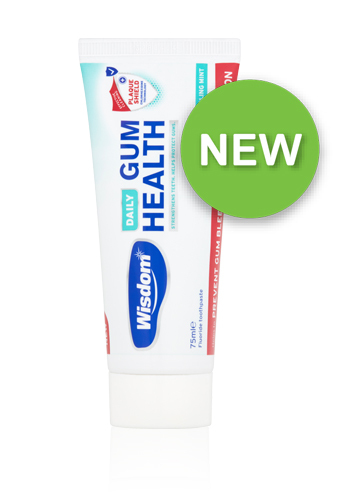 Helps protect gums. If you are experiencing bleeding gums when you brush this can be a sign that you may have gum problems. Bleeding or inflamed gums could be the first sign of gum disease and can be caused by the build up of plaque bacteria along the gum line. 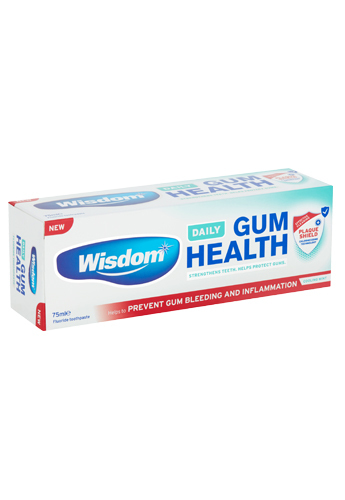 Wisdom Daily Gum Health fluoride toothpaste has a unique patented plaque shield technology* developed to help prevent gum problems. The chlorhexidine formulation helps to prevent plaque build up along the gum line whilst the gum strengthening ingredients help to tighten and rejuvenate delicate gum tissue. Ingredients: Aqua, Hydrated Silica, Sorbitol, PEG-8, Aluminum Lactate, Sodium Lauryl Sulfate, Aroma, Limonene, Cellulose Gum, Sodium Monofluorophosphate, Zinc Citrate, Sodium Hyaluronate, PVP, Sodium Saccharin, Taurine, PEG-40 Hydrogenated Castor Oil, Sodium Benzoate, Titanium Dioxide, Chlorhexidine Digluconate, CI 12490, CI 77492. Warnings: Not suitable for children. In case of intake of fluoride from other sources consult a doctor or dentist. Avoid tannin containing foods or drinks such as tea, coffee and red wine up to 1 hour after use to help avoid dental staining.